Research papers on complexity leadership theory examine the theory that draws the conclusion that the manner in which followers reacted to their leader was contingent upon more than just the action of the leader. Despite the fact that leadership is one of the most widely discussed concepts in organizations today, few authors have been able to define leadership in a meaningful manner. Dering (1998) contends that the inability of experts to fully define leadership is due, in part, to the way in which conceptualizations of leadership have changed over the course of history. According to Dering, leadership has been studied since the time of the Ancient Romans. From this time onward the specific notion of what serves as the basis of leadership has changed significantly. “The literature of leadership has expanded from the notion that people are ‘born to greatness,’ through the ‘accidental’ premise, to a fascination with personal characteristics”. Further adding to the obfuscation that exists when it comes to defining leadership, in many cases, the manner in which leadership is defined is predicated upon how leadership will function in the organization. In some cases, leadership is a set of actions that must be utilized by the leader in order to garner success. In other cases, leadership is the creation of a specific culture that propels others in the organization to work toward meeting the needs of the organization. 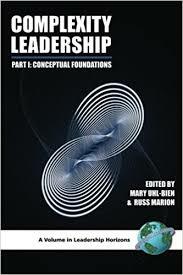 Thus we can see how the complexity leadership theory has come into being. Complexity leadership theory is the confluence of complex, interdependent, unpredictable, and dynamic interactions that make up a leader’s task. Beginning in the 1960, theorists examining the process of complexity leadership theory came to the conclusion that the manner in which followers reacted to their leader was contingent upon more than just the action of the leader. To this end, contingency theories of leadership began to proliferate. Chemers (1997) argues that, “…The contingency perspective that holds that the style of leadership that will have the most positive effects on group process and productivity depends (is contingent) on the nature of the leadership situation. Different situations (in terms of clarity, follower support, leader’s authority, etc.) require different kinds of leadership”. With this in mind, it become clear to many researchers that the context of leadership needed to be examined in a more holistic manner—which included the environment in which leadership took place—in order for the full impact of leadership to be delineated. Chemers goes on to note that by understanding the specific context in which leadership took place, researchers could better understand why leadership qualities that worked in one situation were not satisfactory for leadership development in another. Chemers asserts that, “Because leadership is primarily the exercise of social influence, the ease with which a leader is able to influence his or her followers should make a big difference in how ‘favorable’ the leadership situation is for the leader”. In this respect, the leadership proposition adopts and “if, then” paradigm in which the behavior of the followers is contingent upon the action of the leader and vice versa. Clearly, the contingency model of leadership is one that provides significant variability for helping researchers understand why specific leadership styles are appropriate in certain contexts and others are not. In spite of this marked flexibility, the contingency model of leadership institutes a proscribed formula for deriving the overall effectiveness of a leader in any given situation. Rice and Kastenbaum (1983) note that under the contingency model leadership style is measured by the Least Preferred Co-Worker (LPC) scale. “Leadership effectiveness is evaluated in terms of performance on the central task of the group. The situation faced by the leader is analyzed in terms of the degree to which specific situational factors provide the leader with influence and control over the behavior of other group members”. By combining all of the factors associated with leadership, it is possible to create a situation that will fit the leader’s overall style. History of the Steel Industry - Evolution of the Steel Industry Research papers on the changes in the steel industry and its management. Decision Making - Decision Making Research Papers discuss how business is critical. An Application of Leadership Principles is an analysis of work situations that involve leadership. Paper Masters writes custom research papers on complexity leadership theory and examine the theory that concludes the manner in which followers reacted to their leader was contingent upon more than just the action of the leader.